C.J. McCollum is recording not one, but two radio sessions today. The NBA’s Most Improved Player wears a red short sleeve Nike hoodie that, probably intentionally, matches his red Jordans and red and black socks. He sits in the front corner of the room cracking jokes, mimicking Game of Thrones accents, and fiddling with his iPhone, which rests between two small plastic bottles of Shamrock Farms low-fat chocolate milk. There are actually four of us crowded into this small recording studio in the iHeartRadio offices, which take over the third floor of a conservative, corporate building about 20 minutes south of Portland, Ore. KXJM JAM’N 107.5’s assistant program director and promotions director Geoff Owens—known on air as G-Off—stands at the back of the studio facing DJ, rapper, and co-host Terrance Scott—more commonly known as Cool Nutz—and the Portland Trail Blazers’ 6’4” shooting guard. Muted Seinfeld reruns play on TBS on a television screen behind the two hosts. Normally he would just be doing one show in the studio, but McCollum also has to gear up for Game 3 of the Western Conference Semifinals. After four starters left before beginning of the 2015-16 season, his Blazers were expected to falter hard; back in October, a playoff run seemed wholly impossible. Yet, the team had just returned from Oakland and was looking forward to two more competitive games at home. As such, G-Off, Cool Nutz, and McCollum planned to pre-record multiple shows for any sort of playoff outcome. “Why couldn’t you win 26 like everyone said?” chides G-Off before they start recording. I can listen to John Legend before a game and be perfectly fine. I don’t need Future all the time!. I don’t need trap music. I’ll listen to 112 before a game. “Sowwy” the 24-year-old McCollum replies, drawing out the childlike retort and taunting his producer in a way that does not, in fact, convey an apology. McCollum is genuinely jazzed to be in the studio today. You can tell by the way his demeanor changes while recording. The scowls and shade he threw at Draymond Green during the semis is replaced with a goofy grin. His body moves loosely, and he laughs easily and genuinely. Since Nov. 5, 2015, McCollum has co-hosted the “Playlist” program on JAM’N—Portland’s hip-hop and R&B station. Each Friday from 10 p.m. to midnight, McCollum picks his favorite tunes and talks sports and pop culture with Cool Nutz. For these two shows, they discuss everything from Cinco de Mayo plans to the latest episode of Game of Thrones (hence the voices) to the NFL Draft and how his Cleveland Browns will fare next season. Hearing McCollum excitedly describe food, in this case an unspecified beef-based dish from a local restaurant, is more hilarious and engaging than most judges’ commentary on Iron Chef. This weekly radio gig is yet another element of McCollum’s burgeoning secondary career. Having studied journalism at Lehigh University, earning degrees in broadcasting and mass communications, McCollum immersed himself in college media. He worked his way up to the editor-in-chief of the school paper The Brown and White and interned for Lehigh Sports, interviewing coaches and fellow Patriot League student-athletes before and after matches. Even then he recognized the importance of having a career post-ball, especially one that he enjoys. Since then, his forays into digital and broadcast journalism have already been well documented and universally lauded—from his written “Year 1” rookie diaries with Sirius XM Radio to his interview with NBA commissioner Adam Silver that ran on Forbes.com. His byline has appeared in Maxim, NBA.com, The Players Tribune, and more. He also regularly guests on Portland’s sports radio station, 620 AM Rip City Radio. Of course, on the court, McCollum’s game has been steadily improving in the three seasons since the Blazers scooped him up as the 10th pick in the 2013 Draft. 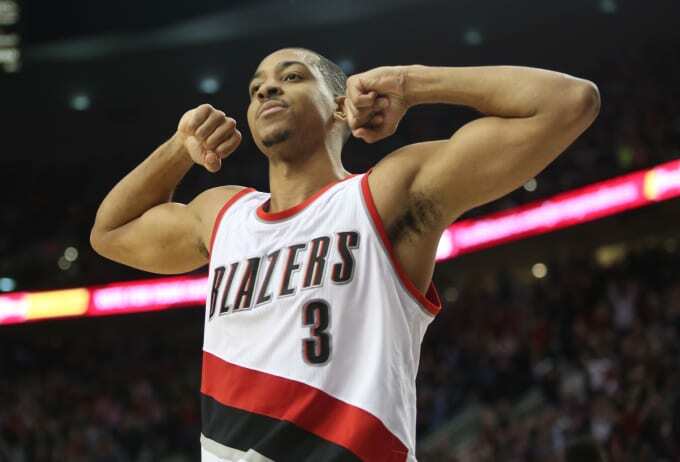 After recovering from a foot injury his rookie season, McCollum’s quiet ferocity helped him earn Most Improved Player status this season—an honor that he didn’t know he would receive until Blazers coach Terry Stotts nudged him the night before the press conference. Additionally, McCollum’s connection with All-Star point guard Damian Lillard is not just statistically impressive, but also fun to watch. Their obvious kinship (which may or may not have anything to do with the fact that their moms, who both moved to Portland to live with their sons, have also become friends) is one of the reasons the duo earned the third-highest scoring average in the league at around 45.9 points per game. 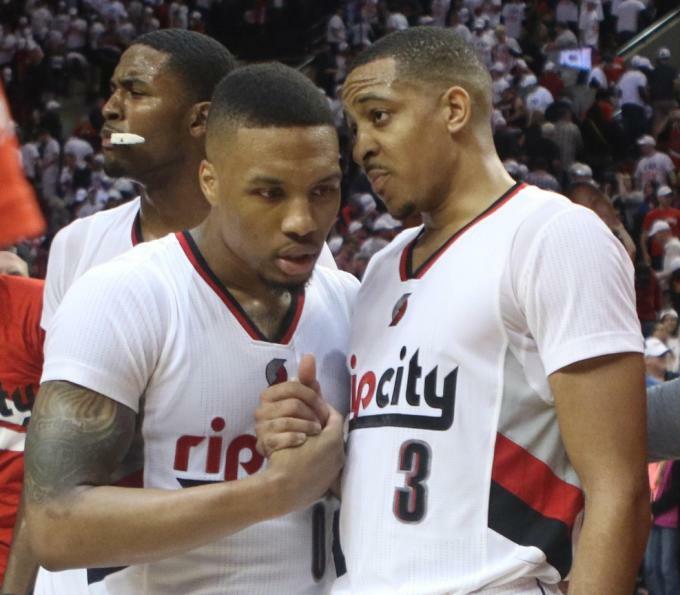 Lillard and McCollum. Image via USA TODAY Sports/​Jamie Valdez. While many know about broadcast journalist C.J. and his MIP stats, DJ McCollum is less recognized, especially outside of Portland. His musical background, fostered by his family in Canton, Ohio, spans an impressive range of slow jams, pop tunes, classic soul, and modern rap. He even played percussion—snare, bass, and xylophone—as a kid. Growing up, he recalls, “My dad played a lot of old school music—Curtis Mayfield, Temptations.” McCollum remembers watching his dad “wash his car, play his music, and get in his zone.” Likewise, he recalls his mom playing music while cleaning the house and settling down after work, as well as at the end of each day. But his musical education extends past his immediate family. In the Blazers’ practice facility, just a few miles from the iHeartRadio studios, the relationship between sports and music assumes a different role. Shoes squeaking on the hardwood create the melody of athletic feats. Members of the Blazers’ bench dribble at different paces, thumping out polyrhythms while the net swishes of baskets parallel snare drum brushes. Listening to these sounds, I ask McCollum if he thinks his musical upbringing contributes to his game. When I’m on the radio, I talk about whatever I want. There’s no filter. It’s my show. Although McCollum twice refuses to show me his moves—once on the sideline of the practice center and again later in the studio—he readily offers insights on his musical tastes and inspirations. In order to find new music, he actively peruses Twitter and Instagram, as well Soundcloud for new artists and releases and Top 100 radio for what’s trending at the moment. Rather than buying vinyl or other physical media, he prefers downloading songs to his iPhone or digitally streaming music via Apple Music or iHeartRadio, dropping his partner company’s name like his rapping teammate Dame drops dimes. 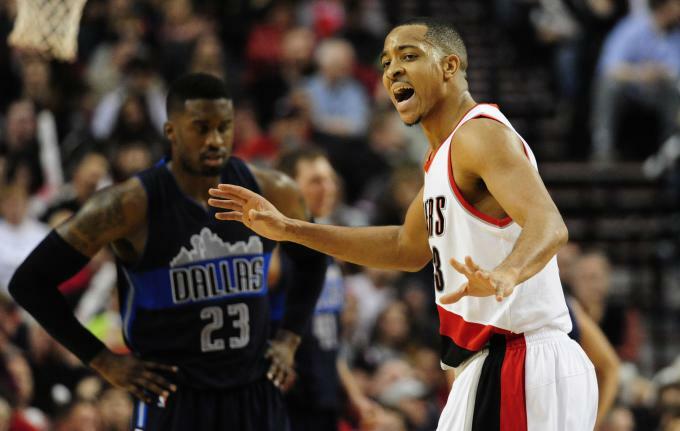 Before games, McCollum’s personal playlist depends on his mood. “I can listen to John Legend before a game and be perfectly fine. I don’t need Future all the time!” he says. “I don’t need trap music. I’ll listen to 112 before a game. Then the next day I’ll feel like I’ll wanna listen to Nas, and then I’ll be playing The Black Album. Both G-Off and Cool Nutz admire McCollum’s range of musical knowledge. Cool Nutz name-drops classic soul singers like Aretha Franklin and Marvin Gaye as specific artists he’s been impressed McCollum knows and enjoys. “His knowledge of the O’Jays and Isley Brothers and stuff like that is always the most surprising. Sometimes you forget how old those songs are,” he says. And so on “Playlist,” McCollum has the opportunity to share his diverse taste in music, as well as sides of himself that do not necessarily come through on the court. Between each three-minute talk segment or song introduction (a shorter break that lasts 30 seconds to one minute), he sings in falsetto along with “Between the Sheets” and “Let’s Get It On,” debating which classic song should be the Oregon Culinary Cut of the Week. He selects bangers by Yo Gotti, Kendrick Lamar, Drake, and more to play between hip-hop classics by Tupac, Jay Z, and Biggie. Both G-Off and Cool Nutz know that attitude is an authentic portrayal, too. They recognize that McCollum’s genuine personality is good radio fodder, but laud his approachability—on-air and in-person—and how that benefits Portland’s community development. As for the MIP himself, his goals for DJing are humble.